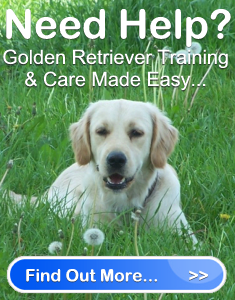 Golden Retriever Training Made Simple | Golden Retriever Savvy " "
It is true that Golden Retrievers are incredibly loyal, social and friendly. However, if you want to make the most of these qualities you need to provide your dog with Golden Retriever Training. Training is essential to the development and wellbeing of any dog breed. Without training, a dog will be left to his own devices. It would be like letting a kid run wild without any discipline…not a pretty picture. There are many things you will need to teach your Golden to do and not to do. For instance, while you’ll want to housebreak him, you will also want to teach him not to jump up on people. There is a right and a wrong way to train a dog. The best way to learn proper training is to enroll your Golden in an obedience class. Find out the age requirement of your local obedience school and sign him up as soon as he meets it. However, before you take your dog to obedience training, there are certain basic Golden Retriever training commands you can teach your puppy. One such command is “Stay”. Here are the guidelines you can follow to effectively teach your Golden Retriever to stay. Before you begin the lesson, take your Golden puppy to a quiet room where no one else is present and there are no distractions. Make sure you have plenty of treats ready. 1. Have your dog sit and hold a treat in your hand, so your dog knows you have it. As your Golden reaches for the treat, close your hand. As soon as he pulls his head slightly back, immediately praise him and give him the treat. Timing is everything at this point of the lesson. Continue to repeat this session, until your dog instantly pulls back when he sees the treat, instead of reaching for it. Once you are successful, take a short break, and have a play time with your pup. Remember, your puppy has a short attention span. Therefore, it is important you break up Golden Retriever training sessions, so you don’t bore your puppy and your training remains effective. 2. Once you have taken a break, start training again by repeating the first lesson. Except this time, wait for two seconds after your Golden pulls back before you praise him and give him a treat. Make sure your dog is sitting when you give him a treat. If he stands, take a few steps away from your dog and try again. You will want to repeat this exercise until your Golden is sitting for 5 seconds before you give him a treat. Don’t move away from the dog during this time. Make sure you stay by his side during these lessons. One of the biggest problems owners have when teaching the “stay” command is they try to leave their dogs too quickly. Think about it: if your Golden won’t stay when you’re right beside him, he’s not going to stay when you move away. Take a break after the second lesson. 3. Repeat the second lesson, but this time when you show your dog the treat, tell your dog in a firm voice to “stay”. When you give your dog the treat say something like “OK”. This is a release word which will eventually tell your Golden that he’s permitted to move for the stay position. Repeat this lesson, and each time increase the number of seconds you wait before giving your dog the treat. Your goal is to have your dog sit for 30 seconds without moving. If your Golden moves before you want him to, say “uh-uh” quietly and try the lesson again. Your goal is to teach your dog that “uh-uh” means no treat. If you Golden is moving too quickly, you will want to lower the number of seconds he has to wait. For instance if you were trying for 15, but he is moving, go back and try 10 seconds for a few times before going back to 15. If your dog is continuously making mistakes more than 1 or 2 times in a row, you are moving to fast. Take a break and when going back to the lesson take it slow. 4. Repeat the third lesson, but this time as your dog is sitting, move away from him slightly. Take a single step back then return to your initial position. Then take one step to the side and then the other. Continue to repeat this movement until you can complete an entire circle around your dog without him getting up. Should he move, say “uh-uh” and try again. Just remember to take it slow. 5. Once you can successfully move a full circle around your dog, you will want to further the distance between you and your dog. Take 5 steps away from your Golden. Repeat this lesson until your Golden will stay for 30 seconds. 6. As soon as your Golden Retriever is staying for thirty seconds in the room with no distractions, try the “stay” command in other areas of the house. When practicing in this new area, go back to short stays and stay with your dog. Repeat the entire process until your Golden is staying for the 30 seconds, and you can move 5 steps away. 7. As your Golden becomes more and more successful with the “stay” command, you will want to lengthen the distance you are away from him, and the amount of time you make your dog stay. Your ultimate goal is to have 30 ft. between you and your dog, and have your dog stay for 1 minute. All Golden Retriever training needs to be taken slow and must be consistent. You need to have patience and determination to effectively train your dog.